Wow! Look at G! Quite the dapper gentleman. BTW, I'm loving your variety of avatars. I think the suit was designed just for him. But I was wondering, is this the kind of outfit that kids wear at Kerrville. Great Pictures of a Great Kid! What a handsome dude!!!!! 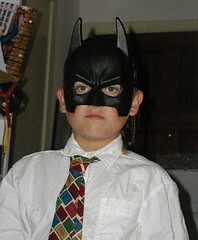 And who is thqat mysterious gentleman in the Batman mask? Was this promotion day?